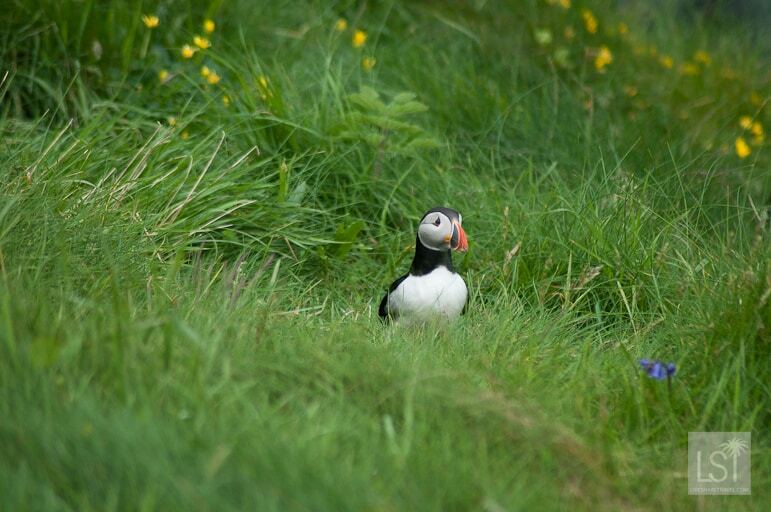 How far would you go to take photos of puffins? I’ve long admired puffin pictures others have taken, and yearned to see them in the wild for myself. 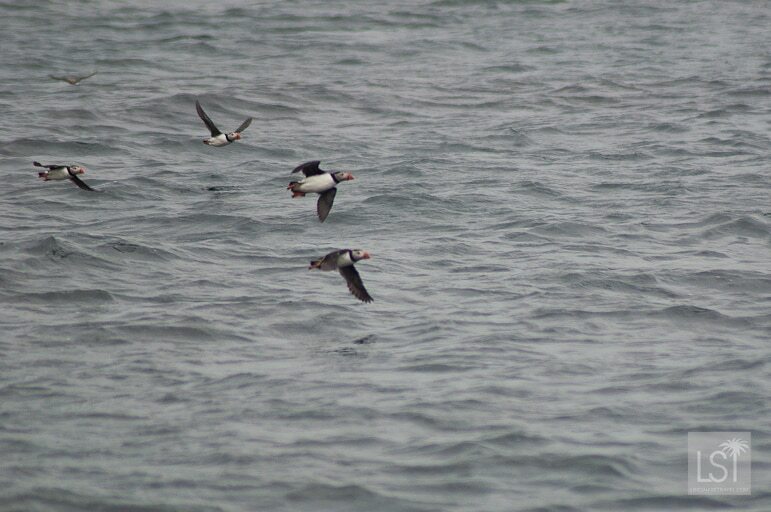 When given the chance to see puffins in Scotland recently I knew it would be a highlight. We were staying at Melfort Village, a beautiful resort south of Oban where other impressive birds like heron and eagles elegantly strode and swooped over the landscape. 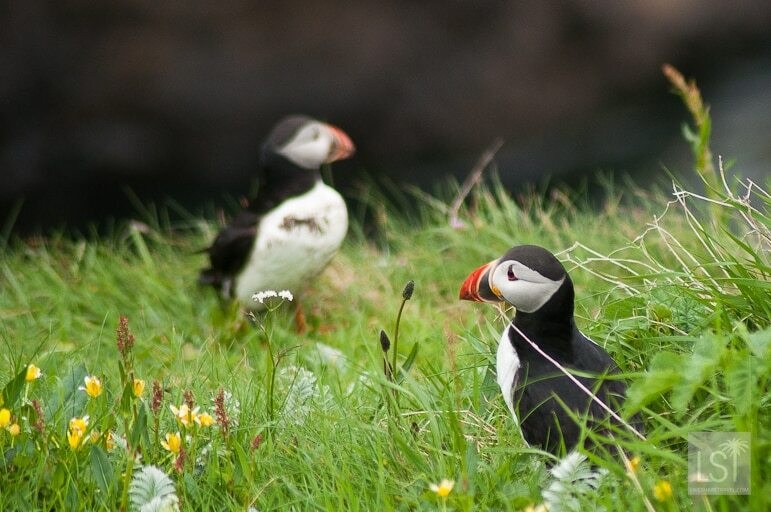 But hearing this was the time of year when you found nesting puffins in Scotland, we sailed to uninhabited Staffa Island to fill our camera with puffin pictures. We took a Three Isles Excursion with Staffa Tours, which visited the islands of Mull and Iona, and arrived at Staffa by boat 35 minutes after leaving Mull. 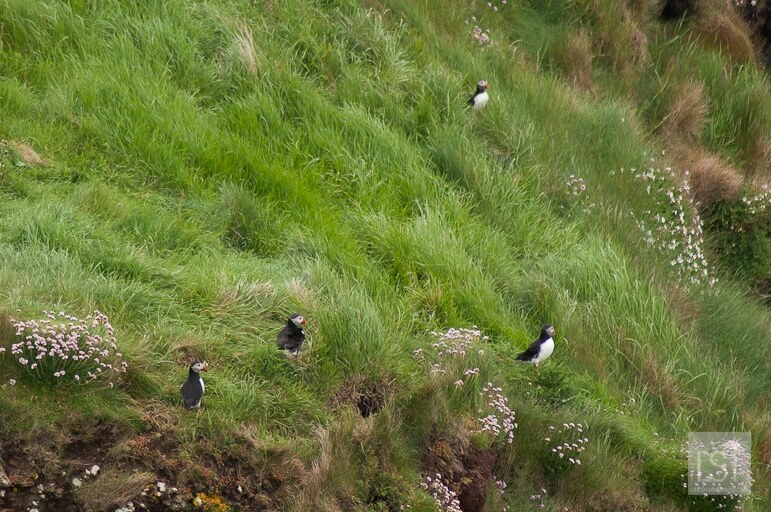 It’s not every day you spot a gathering of puffins in the Inner Hebrides. 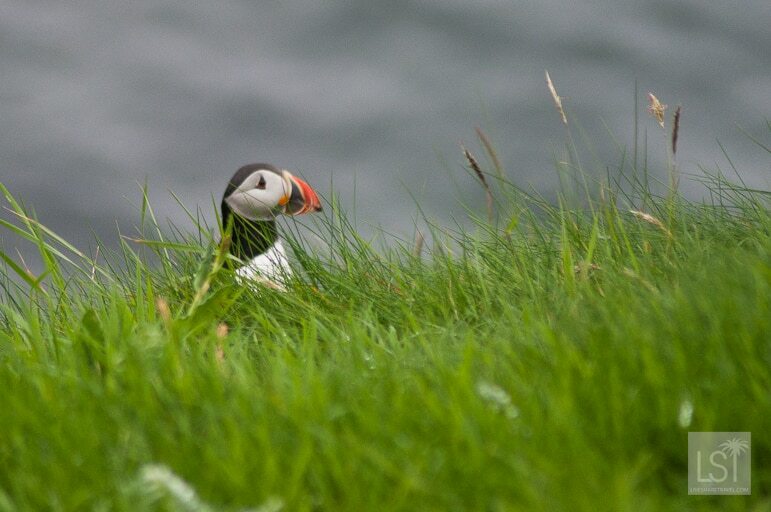 In fact you’ll only see puffins in Scotland from April to August. 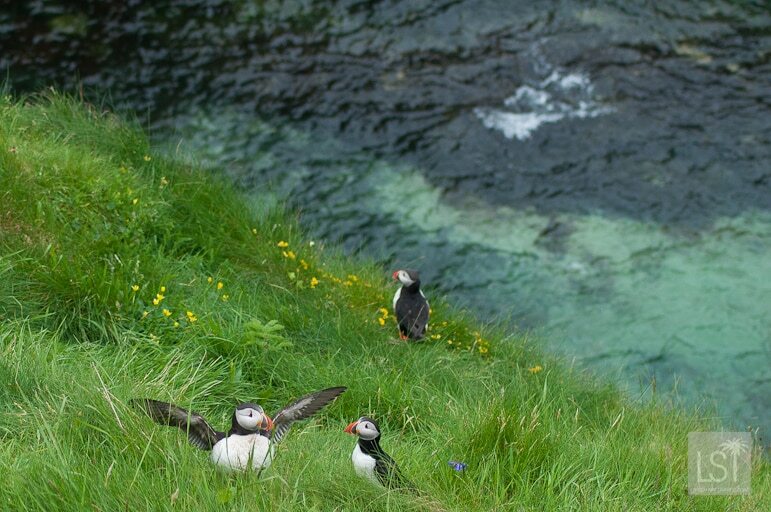 And as we discovered, Staffa Island is one of the best places in the UK in which to take puffin pictures. But then Scotland’s west coast has an abundance of wildlife. We’d already seen everything from feral goats – much wilder than the average it seems – to sea eagles. 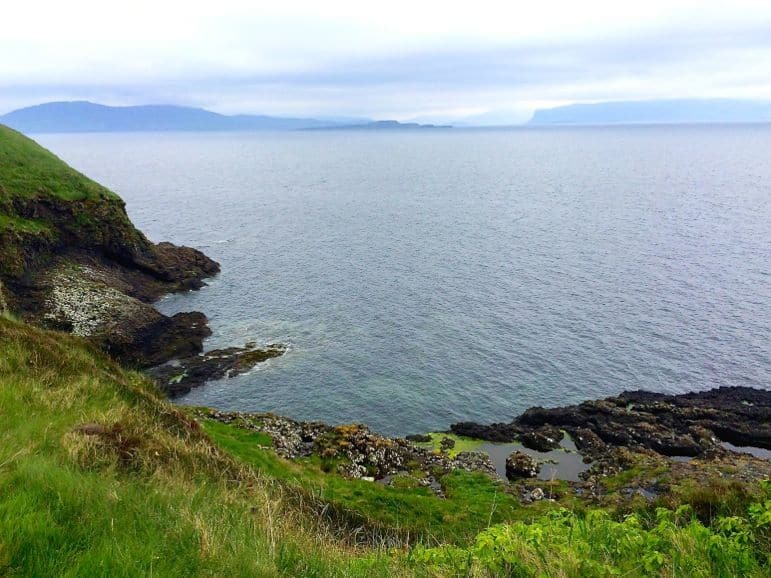 En route to Staffa we’d paused to photograph seals that had hauled themselves out onto rocky outcrops. Landing on Staffa Island we climbed a number of stairs up to hit the top of this chunk of rock. 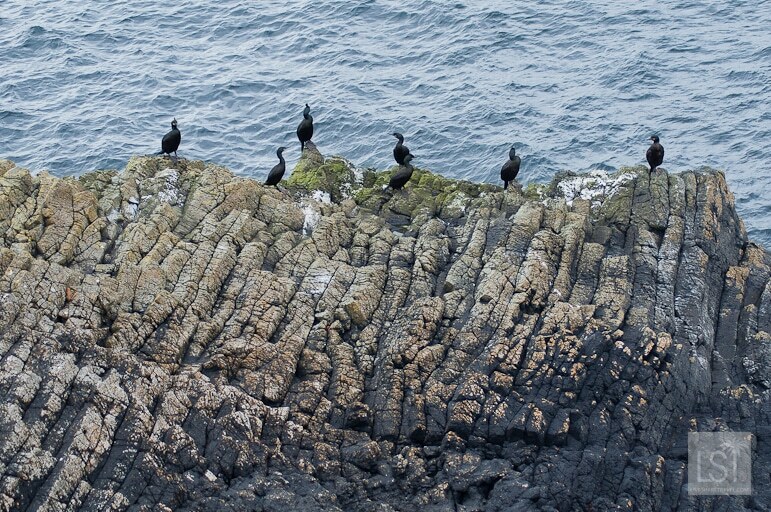 It’s not just puffins you see on Staffa, many birds nest there including cormorants, shags, kittiwakes, fulmars, great black-backed gulls, skuas and razorbills – allowing you to capture much more than just puffin pictures. 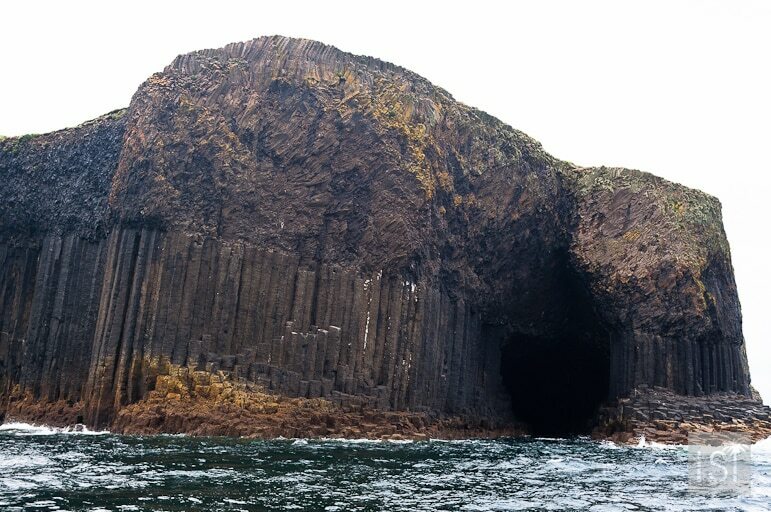 It is also home to Fingal’s Cave, the inspiration for Mendelssohn’s Hebridean overture, with a landscape reminiscent of Northern Island’s Giant’s Causeway. The cave stretches 250 feet and the roof stands 70 feet above the swelling sea. Volcanic lava flows are responsible for the hexagonal columns that form Staffa’s rocky face. I’m no hiker. And was as usual, unprepared (wearing canvas shoes) for a scramble across rocky, muddy and slippery terrain. But nothing was going to stop me. Even the pink marker, showing the puffins’ nesting site, didn’t put me off and that seemed a very distant quarter of a way around the island. 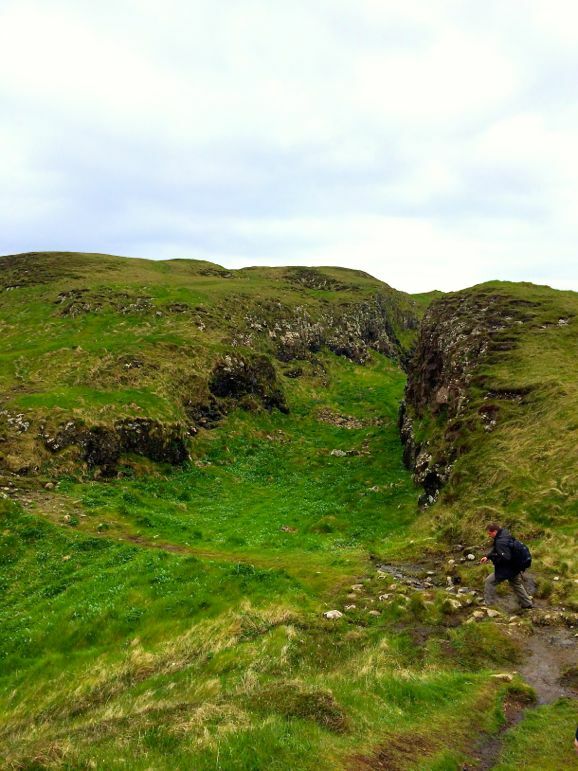 But for once I knew this was a hike with a point – I’d finally see puffins in Scotland. And as we reached the nesting area, all memory of clambering over rough ground and tricky inclines was gone. It’s hard not to love puffins, with their brightly coloured beaks and clownish appearance. They waddle slightly, yet they’re much better on land than in the air. They fly awkwardly and land with very little grace – orange webbed-feet flailing in different directions as they touchdown unsteadily. But I revelled in this animal encounter, and enjoyed privileged moments studying them through my zoom lens as I took my puffin pictures. 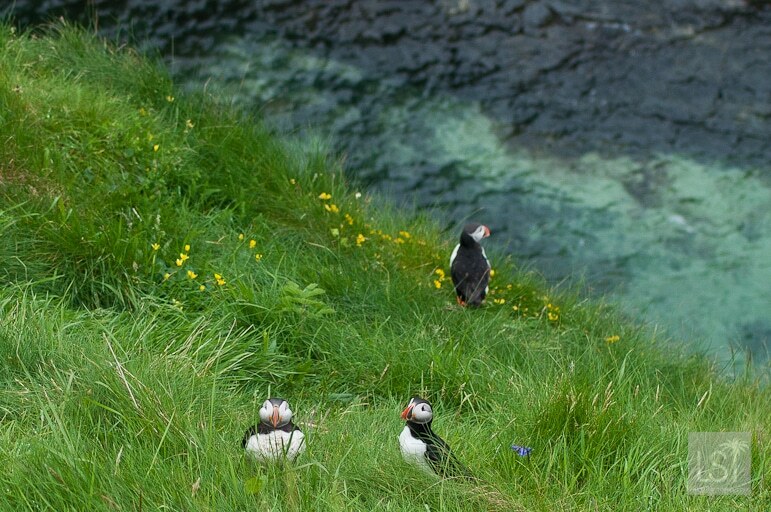 When you spot puffins in Scotland, know that they have flown thousands of miles to nest. On land they move at surprising speeds, at sea they can dive to 60 metres to catch sand eels – their favourite snack, and can live for more than 20 years. 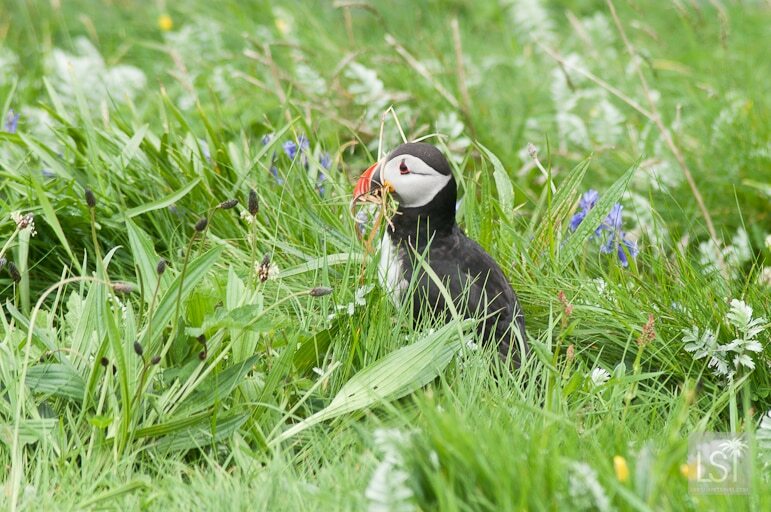 Puffins start arriving on Staffa Island in March/April to nest, their chicks hatch around May/June. During July they care for their offspring, but in August the parents abandon the nest, followed several days later by their sole chick. After massing on the sea, the puffins fly to the mid-Atlantic for the winter. Read more about where we stayed in Scotland: Melfort Village. 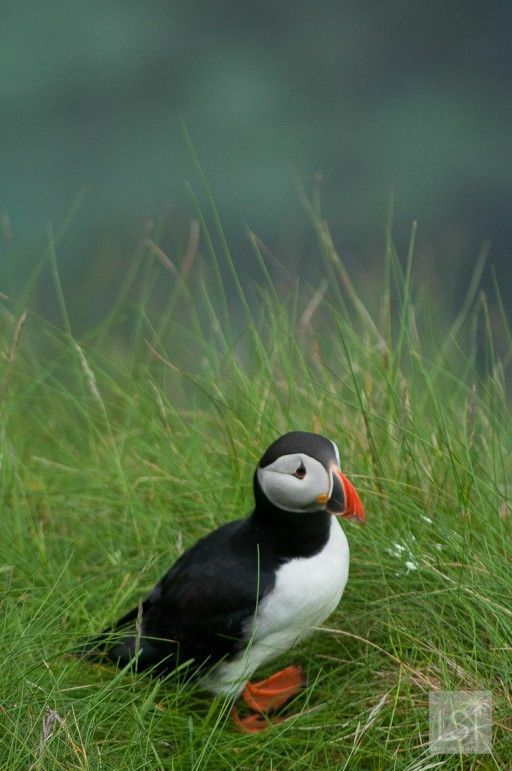 Ahh who doesn’t love puffins! Gorgeous shots! Thanks Becky! Absolutely – they’re so lovely. Ooh, these pictures are just so cute! And what a great place to spot them too. Thanks Esther. Yes, it’s a really great place to spot them – I didn’t write much about Fingal’s Cave but that’s another great spot there as well. Well worth the boat trip!